Set just before WWII, a British heavy arms designer finds himself in Turkey finishing up a contract when he is suddenly ambushed by a gunman in his hotel room. Shocked to have survived with only a grazed hand, the main character Graham is presented with a serious situation of international affairs in which he is the main focus. Much to his horror and disbelief Turkish secret police Colonel Haki informs Graham that he is valuable to both Turkey and to Britain in ways the plain home-centered husband never considered. He is then put on a steam ship from Istanbul to Genoa in order to keep him safe from Nazis agents who were, apparently, the culprits of the botched assassination. The wonderfully rich characters on this steamer and its very descriptive atmosphere make the tale a twisting yarn of suspense and mystery. This is a very enjoyable and suspenseful story. I have not read a novel this quickly in a long time. I was filled with elation when encountering some fine creative writing that could draw a visual scene in less than a sentence. Most authors struggle to set a scene in pages. It is a wonderfully tactile novel! I found two glitches that bugged me. First, if you are going to make a Biblical reference, get it right. Ambler used the David and Goliath story as an analogy but called the hero “Daniel.” Even most rank heathens know it was David and Goliath. 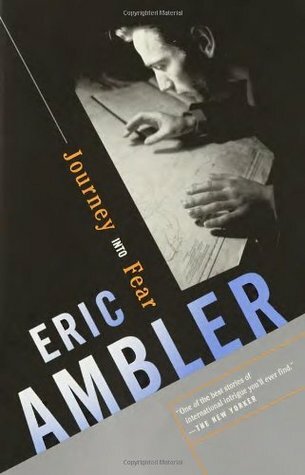 This really bugged me, it cast doubt on Ambler’s intellectual credibility. I got over it pretty quickly. Second, I find it hard to believe that a man who designed artillery guns has never fired, much less even handled, a revolver. I was really shocked by such an incongruity. Weapons designer… never fired a gun? Its absurd. If you are looking for a short and fast paced spy novel (270 pages) that is, in fact, written by a classic author of the genre, give this one a try. I gave it 4 stars on Goodreads.com, its really 4 and a quarter.